Front cover of my newly published book. Map of the 22 former Trappist Missions. 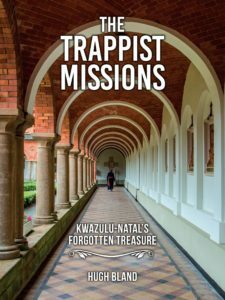 I have just received my hard cover and soft cover books that covers the story of the establishment of these 22 beautiful missions in KwaZulu-Natal. The book focuses on the beauty of the architecture, stained-glass windows, murals and objets d’art relating to each mission. The foreword is written by preservation architect, Robert Brusse, who has worked on these missions for over 40 years. 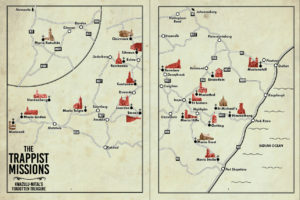 The book is of 184 pages in full colour, with map and illustrations. The soft cover sells for R595 and the hard cover for R795. Below is an order form that can be printed out and emailed to me, or email me direct using the ‘Contact’ dropdown. FOREWORD BY ARCHITECT ROBERT BRUSSE OM MY BOOK (Order form below). So opens the second chapter of a little book, Libyan Fields or the Story of the Missionaries amongst the Zulus in Natal, South Africa…. printed in 1887, and authored by Sihlobosami – otherwise known as Rev. Fr A.T. Bryant , who, as Fr David was the first English member of the Trappist Order at Mariannhill, South Africa. This is probably the first English booklet recording the early work undertaken by the then fledgling Trappist Monastery of Mariannhill. Many books have been written since then dealing with the people of Mariannhill and their work, but few have dealt with the beauty of the built environment that they created there, and on the many mission stations. This book sets out to rectify that omission. It is a book of few words, for images of the many places and everyday objects ‘speak louder than words’. It is one man’s joyous journey through the rich visual legacy that arose from those humble beginnings that Sihlobosami wrote about. After a short introduction outlining the history of its founding, its founding Father and its principal designer and estates manger, there follows a visual pilgrimage from the Monastery Cloisters, to the greater Mariannhill and beyond, to a number of the larger mission stations. The progress through the mission stations has been kept strictly chronological to give some idea of the relatively haphazard opportunities that were offered to and taken up by the Order. Considering how difficult it must have been to travel around this province in the years 1882 – 1910 one stands amazed at what was achieved. One’s admiration is increased when one realizes that much was made from local materials, but much else had to be transported by ship from Europe. A letter of gratitude to the manufacturers of the milling equipment for one inland mission station records that the delivery was perfect and that not a single screw was short! Join us on a visual journey through this book and then… try the reality…. go forth and discover…. ← Durban – Bellair Station – another rotting National Monument.